Update: the promo code has expired. Check the active offers on the right hand side in the column "Current discounts". 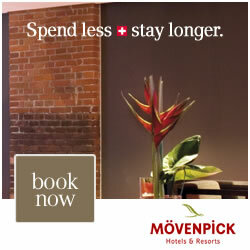 Special offer for stays throughout 2013 at some of the properties of the upscale Moevenpick hotel chain. The 40% is calculated by comparison to their Best Available Rate, so the actual discount might be lower when compared to the price offered by some online travel agencies. The discount is obtained by typing the coupon code in the field "Corporate / Discount code" in the hotel search form on Moevenpick official website. For example, 2 nights (6 - 8 September 2013) at the Mövenpick Resort & Spa Tala Bay Aqaba***** have a total price of 250$ (breakfast included, before taxes and fees), being a 35% discount from the 390$ charged by booking.com.